NEW YORK (AP) — Vogue magazine, perhaps the world's top arbiter of style, is making a statement about its own models: Too young and too thin is no longer in. The 19 editors of Vogue magazines around the world made a pact to project the image of healthy models, according to a Conde Nast International announcement Thursday. They agreed to "not knowingly work with models under the age of 16 or who appear to have an eating disorder," and said they will ask casting directors to check IDs at photo shoots and fashion shows and for ad campaigns. The move is an important one for the fashion world, said former model Sara Ziff, who was discovered at 14 and has since founded The Model Alliance, dedicated to improving the working conditions of models and persuading the industry to take better care of its young. "Most editions of Vogue regularly hire models who are minors, so for Vogue to commit to no longer using models under the age of 16 marks an evolution in the industry," she said. "We hope other magazines and fashion brands will follow Vogue's impressive lead." American, French, Chinese and British editions of the fashion glossies are among those that will start following the new guidelines with their June issues; the Japanese edition will begin with its July book. "Vogue believes that good health is beautiful. Vogue Editors around the world want the magazines to reflect their commitment to the health of the models who appear on the pages and the well-being of their readers," said Conde Nast International Chairman Jonathan Newhouse in a statement. Models' health — and especially their weight — has been a lightning rod the past few years, especially after the death of two models from apparent complications from eating disorders in 2006-07, but the focus, until now, has been on runway fashion shows. The Council of Fashion Designers of America adopted a voluntary initiative in 2007, which emphasizes age minimums and healthy working environments during New York Fashion Week, and London Fashion Week designers sign a contract with the British Fashion Council to use models who are at least 16. The primary fashion organizations in Italy and Spain banned catwalk models who fall below a certain Body Mass Index level, and earlier this year, Israel's government passed an anti-skinny-model law. Still, there is persistent criticism that the fashion world creates a largely unattainable and unhealthy standard that particularly affects impressionable young girls. "We know that there is an impact for young girls — and boys, by the way — of what is put in front of them in terms of media," said Elissa J. Brown, professor of psychology at St. John University and founder of The Partners Program, a specialized therapy program for children and adolescents. A change in what they see on the pages of prestigious fashion magazines could change the image of what they would strive for, she said. It wouldn't hurt for parents to take a look at healthier looking models, too, she added. "I'm a mother and I hear other mothers talk about the parts of their bodies they don't like in front of their daughters instead of talking about health. If the message becomes about health, it could have a tremendous impact." The Vogue guidelines are largely similar to the CFDA's — no surprise since U.S. editor-in-chief Anna Wintour was instrumental in crafting them. "CFDA is pleased to see all the Vogue magazines unite in support of model health," CFDA CEO Steven Kolb said. "This increased level of support makes the message of 'Health is Beauty' even stronger." Conde Nast, in its announcement, recognized that fashion models serve as role models for "many women," and the publisher wants to ensure that the models in its pages "are well cared for and educated in ways that will encourage and help them to take care of themselves, addressing as many of the pressing issues relating to ill-health in the industry as can realistically be tackled." Ziff said the age restriction is important for other reasons, too. "The use of underaged models is linked to financial exploitation, eating disorders, interrupted schooling, and contributes to models' overall lack of empowerment in the workplace," she said. "We simply believe that 14 is too young to be working in this very grown-up industry, and we're glad that Condé Nast International is making this commitment. In addition to agreeing not to knowingly work with models under 16 or with eating disorders, the Vogue pact says the magazines will help "structure mentoring programs" for younger models and raise awareness of the problem of model health. The magazines said they would encourage healthy working conditions backstage and encourage designers "to consider the consequences of unrealistically small sample sizes of their clothing, which limits the range of women who can be photographed in their clothes, and encourages the use of extremely thin models." Conde Nast publishes other magazines, including Glamour and Allure, but a spokeswoman said there are no current plans for these guidelines to be adopted across the company. 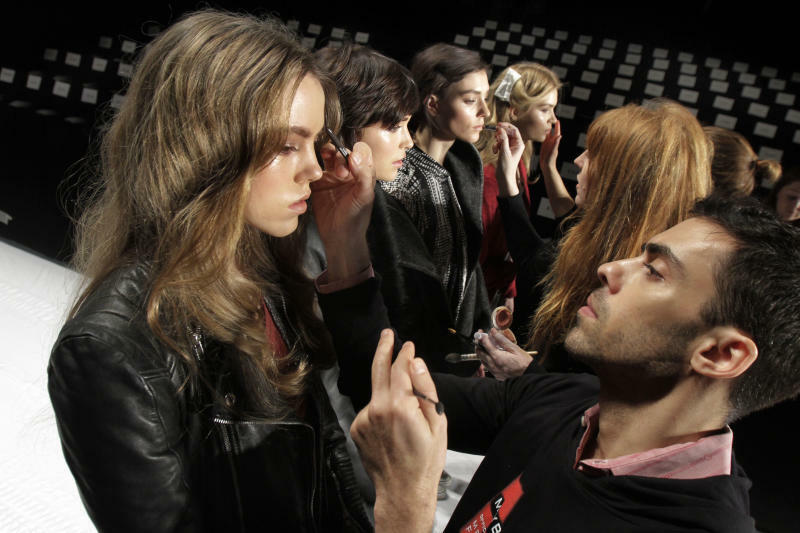 Runway model Coco Rocha applauded the changes. "I've long been a vocal supporter of setting reasonable standards in the modeling industry," she said in an email. "Not every model appears in Vogue, but every model and every magazine looks up to them as the standard (bearer). I can only imagine this will be a solid step in a direction that will benefit models for generations to come. "